I made a point of tracking down some Colorado whiskey when we went to Colorado last year, so it only made sense to continue that tradition when we went to Minnesota. I can't remember when exactly I first heard about Far North Spirits- but I do remember that I liked what I heard and wanted to track down a bottle of their Roknar Rye Whiskey. The design of the bottle and label sticks out first. It's clean, minimal and well designed- it stands out on a shelf and makes the product within the bottle look even better. (Though the color of this stuff alone is gorgeous enough to make me pay attention- such a beautiful, deep shade of amber.) Aren't convinced that 'Far North Spirits' is far north enough? Well, they added the coordinates for the farm, malthouse, distillery and cooperage, so you don't have to take their word for it- which is a beautiful touch that instantly had me fiddling with Google Maps to see what I could get it to do. 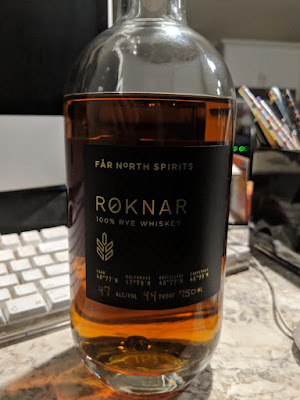 First Impressions: I think this is one of the first 100% rye whiskies I've ever tasted and the aroma was what made me sit up and take notice right at first. The viscosity is well balanced: this is neither weak and watery or heavy and syrupy. There's also a lot of spice to the finish. Color: dark gold/dark honey when you hold it up to a light, a beautiful shade of amber when you don't. Palate: There's a crisp burst of sweetness on the tip of the tongue with this one... initially, I wanted to say oranges, but on subsequent tastings it became more crisp in nature- almost like apples or other orchard fruits followed by a burst of spice.